Sometimes a request from a user who doesn't appreciate the limitations of the technology can jolt you into discovering that an application feature that was, until recently, difficult to achieve is suddenly relatively easy. Dino was asked to allow the user to take photographs and associate them with an item of work. After he'd recovered from the shock, he decided that it was achievable, and now describes how he went on and did it. Web developers generally get asked by friends to write them a plain simple web site for their own personal business. “It doesn’t have to be a truly professional thing,” they usually say while pleading you for help, “it just has to let me track my business activities.” This happened to me recently when a close friend of mine asked for a small web site that would enable her to stop having to record work tasks on her paper agenda. No big deal, I thought. I tried to tempt her with Google calendar and mobile apps, but she wanted to do it the way she’d grown used to. After a busy weekend, I served her a working prototype that had a bunch of HTML forms and a couple of SQL Server tables. She was so happy and started using the site immediately. Guess what? As expected, I was then swamped with a long list of small changes that ‘shouldn’t take much to do’ but would make the site much more enjoyable for her to use. One idea in particular intrigued me, and initially scared me a bit, I’ll admit. She wanted to take pictures and associate these with a work task. Back in 2014, the W3C issued a Media Capture specification to define the way that the HTML INPUT file element can be extended to access any media capture mechanisms that were available on a particular device. This device could be the camera, camcorder, microphone or just the library of media files. 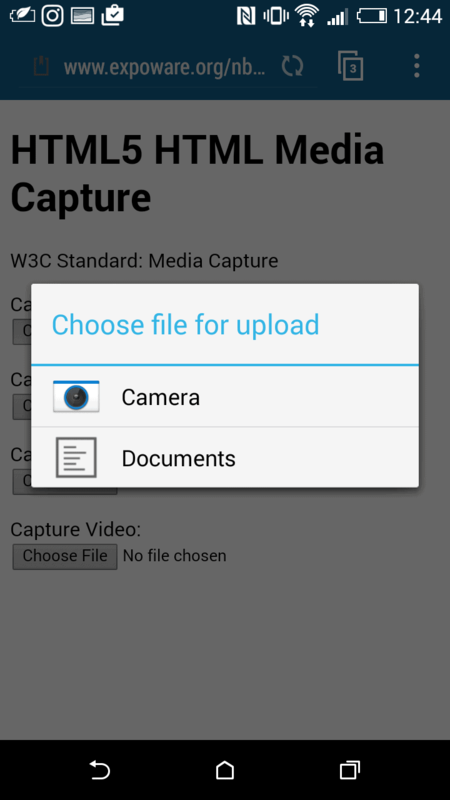 The Media Capture specification is defined here : http://www.w3.org/TR/html-media-capture/. The accept attribute is not strictly related to the Media Capture specification. You can use it to simply suggest to the browser which files it has to show if you browse for a file to upload. Note also that the attribute is not widely supported by browsers, especially within the mobile segment. For more information on the accept attribute you can check http://caniuse.com/#feat=input-file-accept. The most relevant part of the Media Capture specification is the capture attribute. According to the specification, the attribute is a Boolean value that indicates the preferred mechanism for picking the file to upload. If you set the attribute, then you’re telling the browser to use one of the capture mechanisms the device has available, instead of the file system. This is the only the theory, however. In practice, the net effect of the above HTML snippet changes depending on the browser and the form factor of the device (mobile, desktop). Furthermore, you’ll be surprised to see that, in practice, mobile browsers mostly ignore the capture attribute and pay greater account to the value of the accept attribute. Let’s see what some browsers do when processing the HTML file input element with the capture attribute. As you can see, the capture element seems now to accept a string instead of a Boolean value. Feasible values for the capture attribute seem to be ‘microphone’, ‘camcorder’ and ‘camera’. Both iOS 6 and Android 4—the oldest versions of the most popular mobile operating systems supporting file upload—completely ignore the capture attribute. At present, both the above code snippet and the code snippet below produce the same output. Only the value of the accept attribute is processed, and browsers use it to decide which options to offer to the actual user. Figure 1 shows the effect of the code snippet on a recent iPhone device. The user clicks the camera button to add a picture to the currently displayed record and the iOS device responds as shown. The screenshot is taken from a device equipped with iOS9. 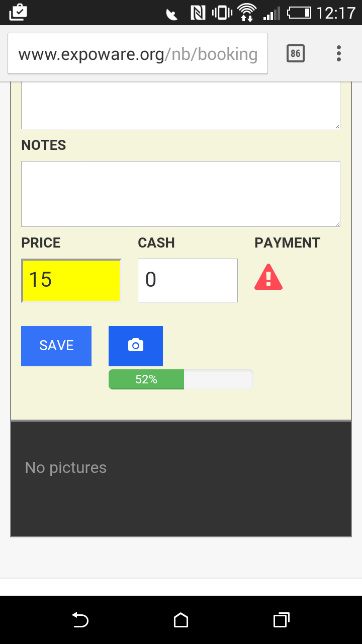 In Figure 2 a sample HTML page shows what happens when you view it with an Android device. 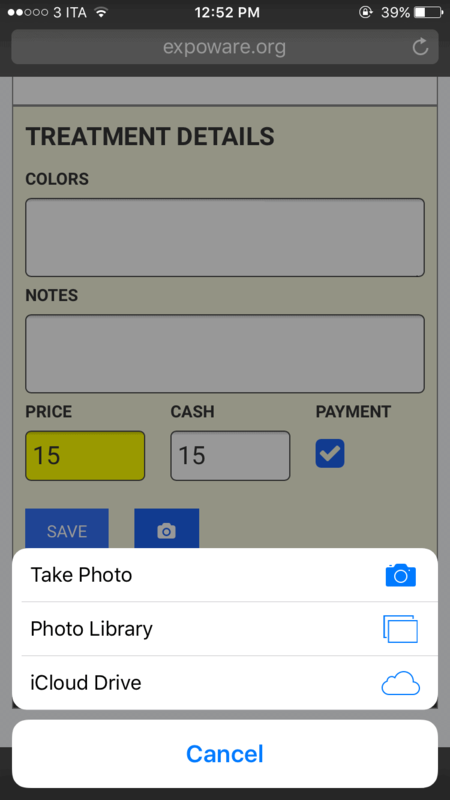 The markup discussed so far, the old familiar INPUT file element with the extra accept attribute, serves well the purpose of letting mobile users to upload a picture that is already saved to the local gallery or to snap a new one. In fact, by selecting the Camera option (See Figure 2) the device will switch to the camera to let users tap and save a new photo. This is only part of the work required, though, for a realistic web page. The process of selecting an existing photo or taking a new one is only the first part of a larger slice of work. Having got the image, how would you then upload the image to the server and store it? For an expert ASP.NET developer, it is no big deal to upload an image to the web server using the INPUT element. The browser does most of the work required on the client side. On the server side itis sufficient to arrange a controller endpoint that can accept a parameter of type HttpPostedFileBase, as below. Initially, I coded the file-selection and upload tasks in the traditional way. This involved placing the INPUT file element in a HTML form and letting the submit button of the form do the hard work of serializing the form’s data and uploading it via the browser. It worked fairly well as long as I tested it on the desktop. When I moved it to a staging web server and accessed the pages with a mobile device I noticed a couple of interesting things. First, submitting a form via the browser in the standard way is not a pleasant experience for the user: Not that this really comes as a surprise, but especially on an average mobile phone is can be painfully slow. Second, when you take a picture with a mobile device the resulting picture is typically quite large as most devices these days have amazing cameras. The combination of these two factors made for a typical unacceptably long upload time with nearly no feedback for the user. My friend didn’t like it and asked for some improvement. The primary improvement to the upload procedure is to change it to use XmlHttpRequest and FormData. You programmatically build up an HTML form using the FormData object and, when done, pass it to XmlHttpRequest to post to the remote URL. The server side of the code remains unchanged: a controller endpoint accepting a HttpPostedFileBase object. Retrieving the file name is an easy step. The code above shows how it could work with the DOM API. All files selected through the INPUT element are gathered in the files collection of the underlying DOM object. If you enabled multiple file selection on the INPUT element (by adding the multiple attribute) then all selected file names are made available through the files collection. If defined, the upload property indicates the XmlHttpRequest ability to support advanced monitoring features, such as a progress bar. The following code registers an event handler for reporting back the progress made on the upload, and to handle completion of the upload. Finally, you can even implement a cancel feature. Next, you simply start the Ajax post to the web server endpoint. Note that XmlHttpRequest may support progress events for both download and upload operation. However, download events fire on the XmlHttpRequest object itself whereas upload notifications are fired on the upload child object. Figure 3 presents a screenshot of the upload feature of the sample application. One more tip for the user interface is to keep the actual user interface of the HTML INPUT element hidden and use a plain button to control it programmatically. In Figure 3, you can see a button with a camera icon. It’s a plain Bootstrap-styled client button. In the same page, hidden from view, there’s the INPUT file element. When the camera button is clicked, it simply passes the event on to the INPUT element. You have an extra HTML element around, but the final effect on the user is much nicer. When my friend wanted an application that allowed her to add iPhone picture from within a mobile web site, I admit that it looked like a very hard challenge to take on. In the end, though, I not I implemented the requested feature but I enjoyed doing it too. It led me to discover many features of the HTML DOM and XmlHttpRequest that I didn’t know about. The lesson I learned is that you don’t need a special mobile app to take pictures with an iPhone or Android device and upload them to a server endpoint: you can do it all in the HTML5 and ASP.NET that you’re familiar with. Yeah, and SQL Server too. This looks like the start of something that might bring people back to the browser on mobile. Great article Dino! I implemented the ideas presented here and it worked a treat. Really nice having ones own button in the UI as it renders consistently across browsers. It all worked a treat!